Caution: Wear plastic or rubber gloves and do not touch your face while handling or cutting hot peppers. If you do not wear gloves, wash hands thoroughly with soap and water before touching your face or eyes. Oven or broiler method to blister skins - Place chiles in a hot oven (400°F) or broiler for 6 to 8 minutes until skins blister. Range-top method to blister skins - Cover hot burner (either gas or electric) with heavy wire mesh. Place peppers on burner for several minutes until skins blister. After blistering skins, place peppers in a pan and cover with a damp cloth. (This will make peeling the peppers easier.) Cool several minutes; slip off skins. Discard seeds and chop. 3. Combine all ingredients in a large saucepan and heat, stirring frequently, until mixture boils. Reduce heat and simmer for 30 minutes, stirring occasionally. 4. Ladle hot salsa into clean, hot pint jars, leaving ½-inch headspace. Remove air bubbles and adjust headspace if needed. Wipe rims of jars with a dampened, clean paper towel; apply two-piece metal canning lids. The only change you can safely make in this salsa recipe is to change the amount of spices and herbs. 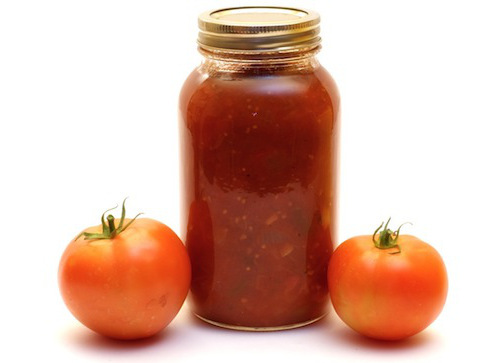 Do not alter the proportions of vegetables to acid and tomatoes because it might make the salsa unsafe. Do not substitute vinegar for the lemon juice.